Steve Soderbergh, discussing the movie which he claims will be his last, stated that Hollywood would not provide the appropriate funds for him to create the Liberace biopic Behind The Candelabra due to the content being "too gay". Having watched the HBO-produced movie, made for American television but blessed with a theatrical release in Europe, it is obvious that only the most brazen, mean-spirited homophobe could take any offence to this rather tame outing. Instead, I propose, the real reason that Tinseltown would not stump up the cash for this film is the simple fact - it's too dull and ultimately pointless. There's little to be told and Soderbergh takes a dispiritingly long time getting there. Like Soderbergh's recent smash hit Magic Mike, Behind The Candelabra begins its life as a rather joyful romp in which it is clear that both cast and crew are having a whale of a time, the joie de vivre becomes contagious, infecting the audience with laughter and mirth. Here Michael Douglas channels his performance as Liberace with flair, verve and an uplifting kinesis, keeping the character recoginsably human even whilst taking levels of flamboyance up to cartoon-ish register. He's a piano playing dervish but ultimately not too good with people, least of all himself. Liberace's life might be fundamentally empty but he fills it with a garish menagerie of ornamental materialism and a revolving door of young lovers the most recent of whom to appear is the naive ingenue Scott Thorson (Matt Damon, who provides a winning take on Mark Wahlberg's Dirk Diggler in this role). The first section of the film is a hoot with Douglas pulling out all the stops as a cantankerous, fabulous, wounded old man, peacocking and strutting through life in a performance which both embraces his camp side and denies his homosexuality - his love of the brash and superficial is achingly sincere and also achingly painful when it becomes clear that his affection for Thorson is the same as his feelings for his material goods. Liberace admires Thorson because of his looks but if a newer, prettier model were to become available, he'd have no qualms cashing in - Liberace, it would seem, is all surface level. This is never more apparent than in the hilarious sequences which feature an alien-looking Rob Lowe as a surgeon/surgery obsessive who is enlisted to give Thorson plastic surgery based on Liberace's blue-print... of Liberace himself. Referring back to Magic Mike, the two films run out of steam roughly half way through the movie when, having energetically introduced the tales' characters in a series of vignettes, the Academy Award winning director curtails the flow of his features by attempting to add dark dramatic twists to what were, until that point, bright and breezy pieces of entertainment. The tonal shifts in both pictures jar badly and each ramp up contrived, and elongated, sections of drama with little pay off. Here, once we've gotten to appreciate both Thorson and Liberace, Soderbergh has them break upgradually for the better part of an hour - it's tedious and the exact opposite of the delirious vigour which defined the opening to the films. It's as if Soderbergh remembers he should be making a serious film and denies himself (his characters and the audience too) the fun which they so crave. Whilst the performances here are clearly of the highest level, there's little emotive weight in a script which, despite its illusions and pretensions, is just as vapid and superficial as Liberace himself. 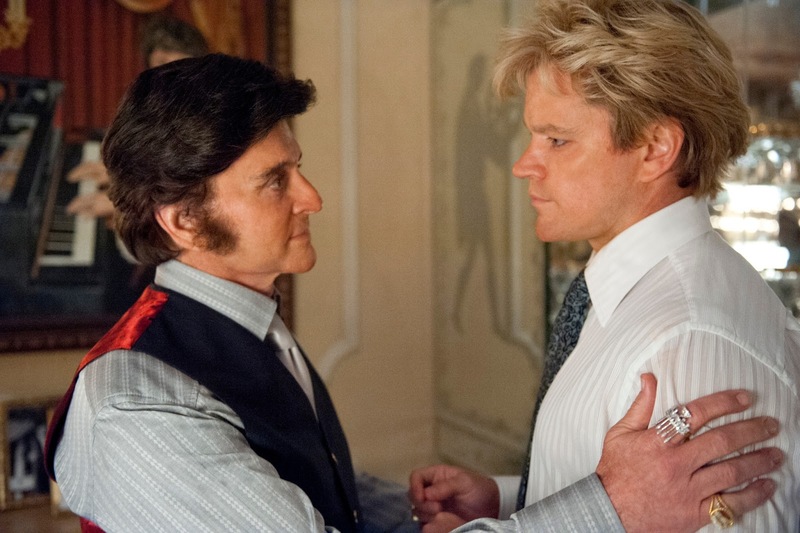 Like Liberace too, Soderbergh seems to be in denial about what exactly Behind The Candelabra should be - whilst this caused the performer a lot of pain, it is the audience who suffer from Soderbergh's decision not to let the film flourish and blossom into the dark comedy it threatened to be. Instead this Liberace biopic is staid, turgid and, ultimately, exactly the type of film I wouldn't fund if I was a Hollywood money man.